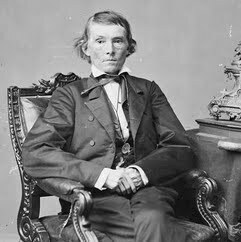 Alexander Hamilton Stephens was an American politician from Georgia and Vice President of the Confederate States of America during the American Civil War. He also served as a U.S. Representative from Georgia and as the 50th Governor of Georgia from 1882 until his death in 1883. He was an old Whig Party friend and ally of Abraham Lincoln. They met in the closing days of the Civil War but could not come to terms.